Green Party volunteer Leanne Chisholm organized the rally that took place last weekend. We are so grateful for all her hard work! She shares this report. If you would like to organize an event, please contact gpns@greenpartyns.ca! Leanne Chisholm opens the Rise For Climate Change rally, September 17, 2018. On Saturday, September 8 th , 2018 approximately 75 people came out to the Halifax Seaport Market to demand a fossil free future. The rally was in conjunction with over 900 other rallies on all 7 continents organized by a group called 350.org based in the United States. The rallies were timed to coincide with the Global Climate Action Summit being held in San Francisco, California. Over 250,000 people participated and yet the event was largely ignored by major media outlets. 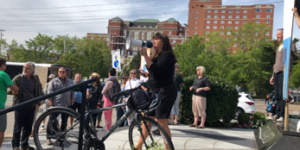 Thomas Trappenburg and Jo-Ann Roberts spoke passionately to our group of protestors and we marched along the waterfront as far as Bishop’s Landing drawing attention to our cause and the Green Party. I hope we can participate in this event again next year and promote the event on university campuses during orientation week to attract more young people to the event and inspire them to become members of the Green Party.